One of the best games (if not the best) in the Castlevania series, and only released in Japan. At the beginning of the game, we are shown a small little intro, from where we (guessing and reworking the Japanese characters in the brain) can understand that some fanatics have resurrected Count Dracula. The vampire, first of all wants to take revenge on those people who threw him. And this is you (more precisely your relatives). Here Dracula steals your beloved girl, and you must save her. Everything is simple as always. But since the game was done by Konami, since we still have a PC Engine with a very large CD drive, the game turned out very good. The graphics are amazing, the sound - well, finally we heard quality tunes. By the way, the game has 7 levels and 5 hidden levels! So be careful and be sure to play - the knowledge of Japanese is not necessary! 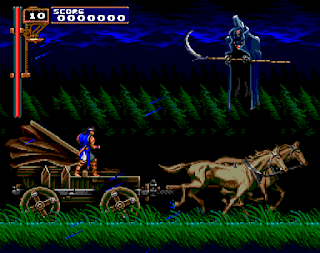 Later the game was slightly reworked and was released on the PSP as part of the Castlevania: The Dracula X Chronicles. Other game titles are Castlevania: Rondo of Blood, Dracula X: Rondo of Blood.